Adding small amounts of strong flavors gives dishes a kick without the need for piling on fat, calories, or sugar. A microplane grater makes this quick and easy to do, says Mary Abbott Hess, R.D., a partner with Culinary Nutrition Associates in Chicago and former president of the American Dietetic Association. Use it to grate spices, hard cheeses, or chocolate, or to zest citrus fruits. Price: $10 and up. Use less oil -- and save calories and fat -- with a mister, which applies just a thin coat of whatever type of oil you choose to use. In addition to spritzing to keep foods from sticking, try this tip from Ellie Krieger, R.D., host of the Food Network's "Healthy Appetite": For crispy goodness without all of the fat, spray foods with oil and bake. "I call it oven frying," she says. Price: $13 and up. What makes this dedicated appliance a worthwhile investment? It's the convenience factor for preparing whole grains, which can take as long as an hour to cook. The programmable timer lets you set it and forget it. "I put steel-cut oats in my rice cooker, add any type of dried fruits and nuts, set the timer for 6 a.m., and it's done when I get up," says Julie Upton, R.D. Or come home from work to find your wild-rice side dish ready and waiting. Price: $60 and up. Krieger loves her nonstick grill pan, as it allows for great flavor development with less fat (which drips into the pan's grooves). "And unlike an outdoor grill," she adds, "you can use it all year long." One tip: Don't crowd the food, or it will steam instead of grill. Price: $40 and up. Lean meats' lower fat content can make cooking tricky: A little too long in the oven, and a moist, perfectly done pork tenderloin or roasted chicken can quickly turn dry. Enter the instant-read thermometer, which takes away the guesswork. "There are so many variables with cooking, from oven calibration to differences among pans, that the only way to tell if something's done is to use this tool," says Krieger. Price: $12 and up. No time to cook? With a bit of prep, slow cookers can do most of the work for you. "I make healthy meals using lean meat or poultry, beans, and plenty of veggies, and it cooks while I'm at work," says Theresa Stahl, R.D. "A little time invested in the morning before heading out the door pays off in healthy dividends at the end of the day." Price: $18 and up. Get a true understanding of portion sizes with this tool. "If you want to know exactly how big 3 ounces of meat is, grab your digital scale," says Betsy Hornick, R.D., a Chicago-based nutrition consultant. Mechanical scales work fine, but our experts prefer the electronic readout for accuracy. Price: $20 and up. Blending ingredients helps bring a richness to dishes like soups and sauces without adding cream, notes Hess. 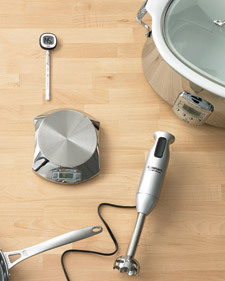 This handy device makes it a cinch, because you put the stick right in the cooking pot to mix (versus transferring ingredients to a blender or food processor). It's great for single-serving smoothies and emulsifying salad dressings, too. Price: $20 and up. Prop styling by Scott Horne; All-Clad slow cooker with ceramic insert, oil mister, and Calphalon One nonstick grill pan all from williams-sonoma.com.